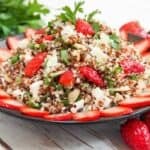 This Strawberry Quinoa Salad is bright, easy to make, and a delicious way to stick to your diet. January weather can be dull, and if you’re trying to eat more healthily, your food might seem dull too. But that can change. We’re bringing you Healthy Family Recipes this week to put some color on your plate! You’ve probably noticed that we all get a bit excited about strawberries this time of year as it’s Florida Strawberry season. Even being based up in Massachusetts, I can appreciate the enthusiasm. We get a steady supply in my local store, I’m glad to say, and I love that I can really smell them in the aisle. My kids are big fans as well, and being fantastically healthy, they are one treat I will gladly indulge. While strawberries are delicious on their own, they also make a great ingredient and not just in sweet dishes. 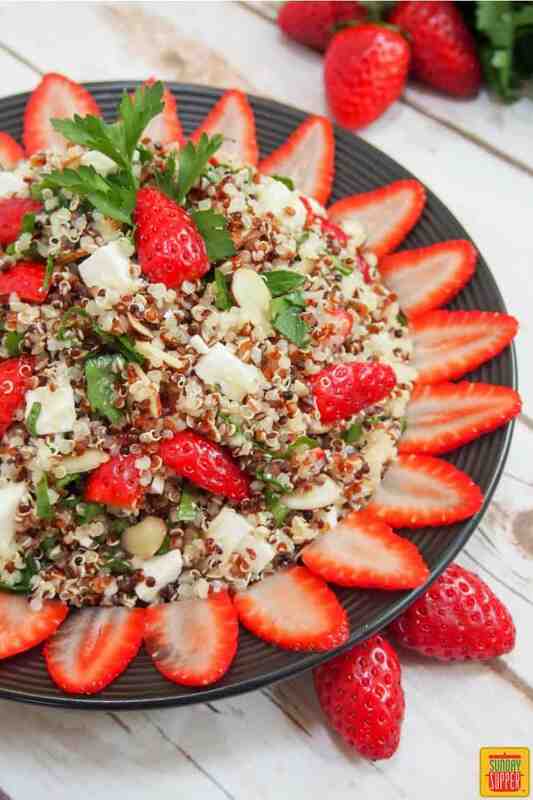 This strawberry quinoa salad is a delicious, easy way to enjoy them as a side or main dish. Try it alongside grilled meats, for example, or pack it for lunch. The only thing you need to cook here is the quinoa, then you simply chop a few things up, shake up the dressing and bring it all together. just eight strawberries gives you your daily dose of vitamin C and more potassium than a banana. strawberries are also virtually fat free, contain no cholesterol, and are a great source of folic acid that helps the body metabolize protein. quinoa is a relatively good source of nutrients compared to other grains, being higher in fiber, protein, anti-oxidants and various minerals. Plus, it’s gluten free. parsley often gets overlooked as just a garnish, but it’s actually a great source of vitamin C, vitamin K as well as having good levels of vitamin A and iron. almonds also contain lots of healthy fats, magnesium and vitamin E, amongst other things. Yes, this salad also has some feta, which is higher in fat, but it’s a relatively small amount and adds a lovely taste to the dish. As with most things, it’s all about moderation. If you’re looking to eat healthier, then join us in enjoying healthy family meals with strawberries during Sunday Supper Month. 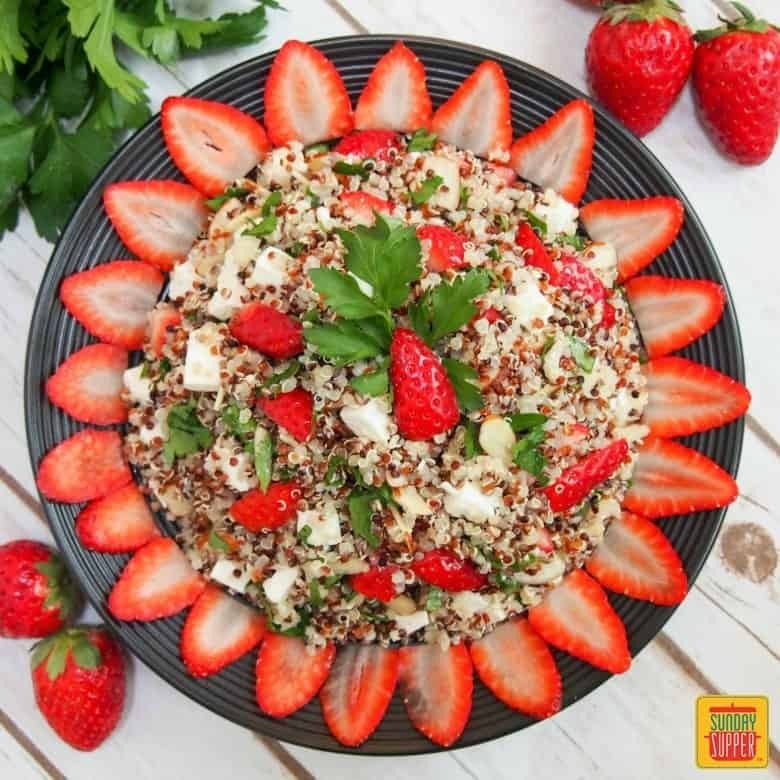 Between the sweet strawberries, smooth creamy feta, crunchy almonds and wholesome quinoa, this strawberry quinoa salad is sure to brighten your plate. It’s a delicious, satisfying and versatile salad. How will you enjoy it first? 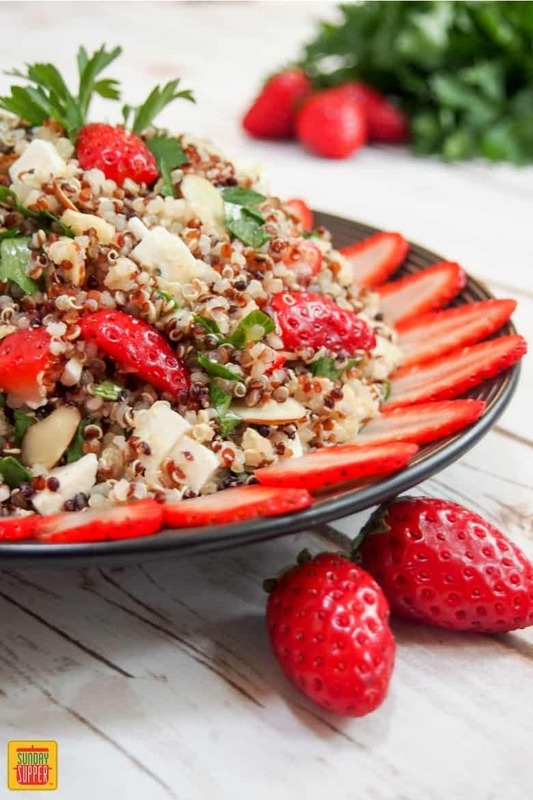 Between the sweet strawberries, smooth creamy feta, crunchy almonds and wholesome quinoa, this strawberry quinoa salad is sure to brighten your plate. It's a delicious, satisfying and versatile salad. Save a few strawberries of similar size to decorate the plate, then cut the rest into quarters, halving larger ones as appropriate. Cut the feta into small dice. Put the dressing ingredients into a small bowl and whisk, or into jar and shake together until blended. Put the quinoa in a bowl and pour over the dressing. Add the parsley and mix together. 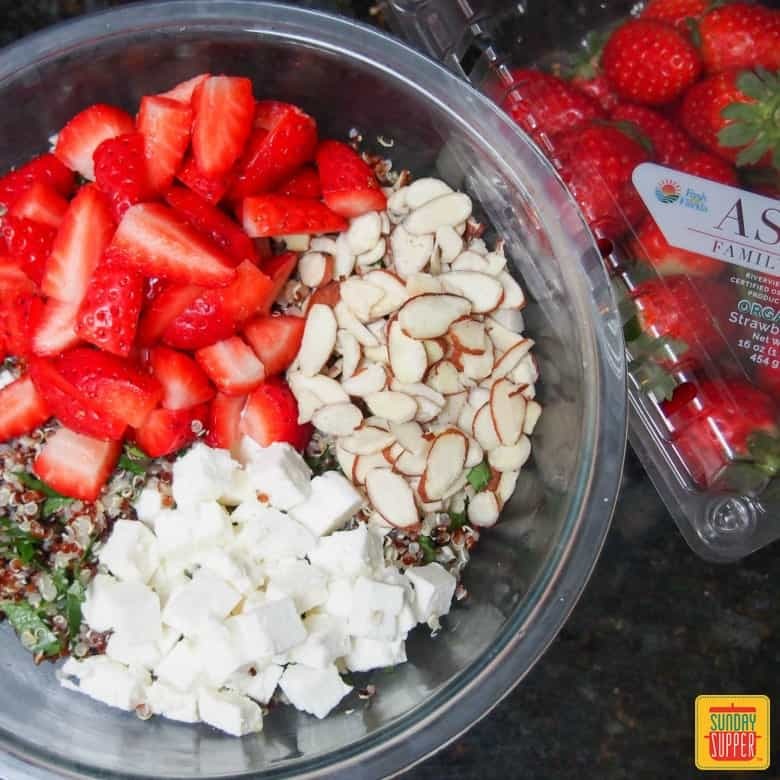 Add the strawberries, almonds and feta and gently mix them all through. Slice the reserved strawberries top to bottom and place around the edge of the plate to decorate. Serve. I used a tricolor quinoa blend but you can use white, red or any other combination as you prefer. We recommend using Florida Strawberries for best results.